The third Convention on Conventional Weapons (CCW) meeting on lethal autonomous weapons systems will be held at the United Nations (UN) Palais des Nations in Geneva on 11-15 April 2016. The following Frequently Asked Questions provide background on the objectives and purpose of this multilateral meeting. The formal proceedings will not be webcast live, but some statements will be posted online. Campaigners will also provide updates, including via Twitter where @BanKillerRobots and delegates will tweet the using the hashtag #CCWUN for the meeting. On Monday, 11 April at 15:00, Campaign to Stop Killer Robots will brief media from the ACANU correspondents association. Human Rights Watch and other campaign members will be issuing publications and related memos for delegates. Campaign representatives will address the general debate on the opening day as well as side event briefings for CCW delegates including media in Conference Room XXIV at 13:00 on Wednesday,13 April, Thursday, 14 April, and Friday, 15 April. UNIDIR is convening a side event briefing on Monday, 11 April. The 1980 Convention on Conventional Weapons (CCW) prohibits or restricts certain types of conventional weapons of concern. Its 1995 protocol banning blinding lasers is an example of a weapon being preemptively banned before it was acquired or used. A total of 122 nations are “high contracting parties” (state parties) to the CCW, including all permanent members of the UN Security Council. Five signatories still have not ratified. After the matter of lethal autonomous robots was first raised at the Human Rights Council in May 2013, nations agreed at the CCW in November 2013 to establish a discussion mandate on questions relating to the emerging technology of what they called lethal autonomous weapons systems. The decision was taken by consensus—a rare feat in today’s traditional disarmament diplomacy—and came less than one year after non-governmental organizations created the Campaign to Stop Killer Robots calling for a preemptive ban on fully autonomous weapons. 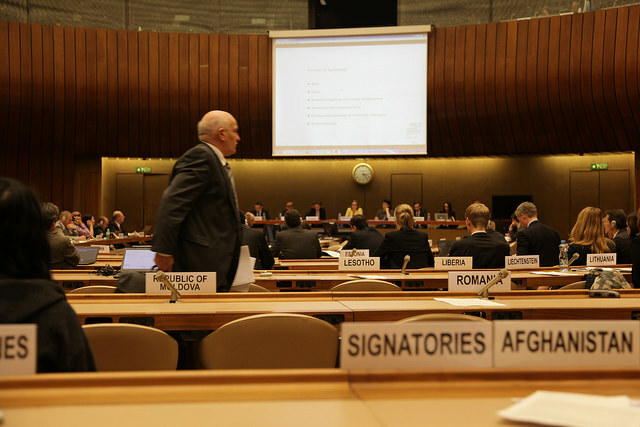 The CCW’s first “informal meeting of experts” on lethal autonomous weapons systems took place on 13-16 May 2014 and the second on 13-17 April 2015. The third meeting opens on Monday, 11 April and runs until the end of the week. Why is the CCW discussing killer robots? At issue are weapons systems that would be capable of selecting targets and using force—lethal or otherwise—without any human input or interaction. They are often referred to as “human-out-of-the-loop” weapons as opposed to today’s “in-the-loop” and “on-the-loop” versions. The concern is that low-cost sensors and advances in artificial intelligence are making it increasingly practical to design weapons systems that would target and attack without further human intervention. If the trend towards autonomy continues, the fear is that humans will start to fade out of the decision-making loop, first retaining only a limited oversight role, and then no role at all. Most agree that fully autonomous weapons systems do not currently exist, but the capacity to develop them is expected to be available within the coming years rather than decades. The US affirmed in November 2015 that “there is broad agreement that lethal autonomous weapon systems do not exist” and do not refer to “remotely piloted drones, nor precision-guided munitions or defensive systems.” Most existing weapons systems are overseen in real-time by a human operator and tend to be highly constrained in the tasks they are used for, the types of targets they attack, and the circumstances in which they are used. There has been strong interest in the process to date at the CCW, with representatives from more than 85 countries attending the 2014 and 2015 meetings as well as various UN agencies, international organizations, the Red Cross, and civil society groups coordinated by the Campaign to Stop Killer Robots. What will happen at the 2016 CCW meeting on killer robots? Approximately 80 or 90 states are expected to participate in the third CCW meeting, including all permanent members of the UN Security Council. The main focus of attention will be the plenary sessions, which run in the morning (10:00-13:00) and afternoon (15:00-18:00) throughout the week. The Campaign to Stop Killer Robots is holding three side event briefings (13:00-14:30) in the second half of the week to present civil society views and make the case for a preemptive ban on development, production, and use of fully autonomous weapons. According to the annotated programme of work issued by the chair Ambassador Michael Biontino of Germany in March, the meeting will open on Monday, 11 April with a general exchange of views for delegations to share positions on national policies and legal provisions. Countries are also invited to “outline expectations regarding the possible recommendations” to be issued by the meeting in accordance with the mandate agreed in November 2015. That afternoon the first session entitled “mapping autonomy” will be chaired by Ambassador Alice Guitton of France and starts with, no less than six presentations by experts from France, the Netherlands, South Korea, Switzerland, and US. The aim of the exercise is for experts to map actual developments taking place or to be expected concerning autonomous systems in general. Tuesday, 12 April is dedicated entirely to discussing how to move “towards a working definition” of lethal autonomous weapons systems. Ambassador Inchul Kim of the Republic of Korea will chair the morning session, which begins with presentations by four speakers from Norway, UK and the US on the concepts or approaches of autonomy, critical functions, and predictability. In the afternoon session chaired by Ambassador Beatriz Londono Soto of Colombia four presenters from Germany, the Netherlands, and UK will address indicator-based approaches, meaningful human control, and human judgment. All of Wednesday, 13 April, is titled “challenges to International Humanitarian Law” and while the CCW has often considered the sufficiency of existing international law, this year the chair has proposed the meeting hold an in-depth discussion of Article 36 of Additional Protocol I of the Geneva Conventions of 12 August 1949. The morning session chaired by Ambassador Urs Schmid of Switzerland will hopefully see “state presentations on current procedures, with an emphasis on possible best practices and/or benchmarks” concerning Article 36 (weapons reviews). The four presenters include the International Committee of the Red Cross and UK and US academics. In the afternoon, Ambassador Päivi Kairamo of Finland chairs the second law session, with speakers from Norway, Sweden, Switzerland, and UK addressing accountability, transparency, and testing and verification procedures. Thursday, 14 April begins in the morning with a session chaired by Ambassador Marta Maurás of Chile on “human rights and ethical issues” that features speakers from Colombia, France, Israel, and South Africa. This will be the last address to the meeting by UN special rapporteur Christof Heyns, who will speak on behalf of the University of Pretoria. The afternoon session chaired by Ambassador Yvette Stevens of Sierra Leone will consider security aspects and the possible regional and/or global destabilization caused by the deployment of lethal autonomous weapons systems. It will begin with presentations by four speakers from Brazil, Estonia, Russia, and Sri Lanka. The following morning the final session, also on security, features speakers from Australia, Denmark, and Singapore and focuses on proliferation risks, including to non-state actors and terrorists, and military value/operational risks of the deployment in different scenarios. The chair will provide a “preliminary presentation” of the report of the meeting, which will be issued in his capacity. Then there will be final statements, if there is time. What’s the expected outcome of the 2016 CCW meeting? States participating in the third CCW meeting on killer robots will not formally take any decisions as the aim of the meeting is to build on the previous two CCW meetings by attempting to establish a common base of knowledge about technical, ethical, legal, operational, security, and other concerns relating to fully autonomous weapons. From this rich dialogue some nascent concepts or principles are finding broad agreement, most notably the notion that meaningful human control must be retained over the operation of weapons systems. However the informal talks are being criticized for “treading water” as they lack ambition, demonstrate no sense of urgency, and reflect the CCW’s usual “go slow and aim low” approach. So the third CCW meeting will deliberate on draft recommendations and perhaps agree by consensus to recommend them to the Fifth Review Conference for a decision on 16 December 2016. Agreement on strong recommendations would be a noteworthy improvement on the previous mandates as it would show that countries are serious about working towards an outcome rather than simply discuss questions raised. Campaigners believe that the CCW’s agreement to consider the matter could lead to a new international law prohibiting fully autonomous weapons at the CCW or outside it. The Campaign to Stop Killer Robots supports continued CCW talks on autonomous weapons systems, but not at any cost. A long, drawn-out process that achieves a weak or no result must be avoided. The campaign calls for a more ambitious mandate aimed at achieving an outcome, with more time set aside for substantive deliberations than just one week in the course of an entire year. The campaign has also urged the third CCW experts meeting to be genuinely inclusive, especially through increased participation of female experts. Outside of the CCW process, the Campaign to Stop Killer Robots calls on all nations to develop and articulate national policy on fully autonomous weapons in consultation with relevant actors, including civil society. We urge states to pursue other ways that these weapons can be addressed at the international, regional, and national levels. We challenge states to become champions of the ban call proposed by the campaign and UN rapporteurs. How are countries contributing at the 2015 meeting? Ambassador Biontino of Germany will chair the third CCW meeting after chairing the previous CCW meeting in April 2015. Ambassador Jean-Hugues Simon-Michel of France chaired the first CCW meeting on lethal autonomous weapons systems in May 2014 and has been replaced by Ambassador Guitton, who is a friend of the chair of the third CCW meeting. The other country representatives serving as friends of the chair to facilitating the expert presentations and deliberations in the various sessions are from Chile, Colombia, Finland, Sierra Leone, South Korea, Sri Lanka, and Switzerland. The new friends of the chair from the previous meetings are Colombia and France. Pakistan’s disarmament representative Ambassador Ms. Tehmina Janjua has been confirmed as president-designate of the CCW’s Fifth Review Conference in December 2016, where states must take crucial decisions on the process going forward and desired outcome. Pakistan was the first country to call for a ban on lethal autonomous weapons systems and is probably the most active proponent of a preemptive ban concluded at the CCW. Pakistan is also the first Non-Aligned Movement (NAM) group member to serve as a CCW Review Conference president. At least 66 countries have made statements on this subject, but few are using those opportunities to discuss their own policy and practice in any detail. The US is the only country with a detailed written policy guiding it on fully autonomous weapons, which it says “neither encourages nor prohibits” development of lethal autonomous weapons systems. Nine countries have endorsed the call for a ban: Bolivia, Cuba, Ecuador, Egypt, Ghana, Holy See, Pakistan, State of Palestine, and Zimbabwe. The Campaign to Stop Killer Robots delegation to the CCW meeting of experts is comprised 40 campaigners from 13 member NGOs in countries including Canada, Colombia, Germany, Japan, the Netherlands, Sri Lanka, Switzerland, UK, and US. It includes key spokespersons Nobel Peace Laureate Jody Williams and roboticist Noel Sharkey. Following the precedent set by previous CCW meetings, the Campaign to Stop Killer Robots will take its seat at the table at every CCW session, as well as make statements, circulate documents, and host side events. See the Campaign Delegation List and List of Side Events. Where are the women at the 2016 meeting? Female experts comprise 42% of the speakers invited to address the third CCW meeting on lethal autonomous weapons systems. Last year, 10 of the 30 experts presenting at the second CCW meeting were women. This growth reflects the strength of the “no more manpanels” initiative that campaigners started after the first CCW meeting on lethal autonomous weapons systems in May 2014 featured 18 speakers but all were men. The German chair of the third CCW meeting has again appointed five female ambassadors from Chile, Colombia, Finland, France, and Sierra Leone in his list of eight friends of the chair assisting him with the meeting. Women comprise half of the Campaign to Stop Killer Robots delegation to the CCW meeting, including side event briefing speakers and media spokespersons. There are 34 expert speakers for this five-day meeting, compared to 30 speakers last year, and 18 at the first meeting in 2014, which was four-days long. If presentations go over time, the sessions could take longer, pushing the time available for the rest of the topics outlined in the programme of work and most critically the concluding plenary with its agreement on the draft recommendations and review of the chair’s report. In addition to running out of time, there is a worry that too many expert presenters may leave insufficient time for country delegations to intervene and make statements elaborating their policy and views or ask questions and generally deliberate on the topics at hand. Some states are requesting “more open discussions without limitations” and that matters as it shows they are keen to start talking more about this topic rather than sit back and listen. Another concern for the Campaign to Stop Killer Robots is to avoid another situation like the one that occurred at the last CCW meeting in November 2015 when campaign representatives were asked to leave an informal consultation after the United Kingdom objected to their presence. The campaign’s exclusion from the consultation was unfortunate, but as the UK ambassador later acknowledged, does not set a precedent for future deliberations at the CCW, where, since 1995, non-governmental organizations have attend all sessions, including off-the-record meetings and informal consultations. Nations have yet to propose a specific action in the Human Rights Council to address fully autonomous weapons, but several continue to affirm its relevance to the emerging international debate over the weapons, including Austria, Brazil, Ireland, Sierra Leone, and South Africa. What next, after this meeting? The next milestone for the international process concerns is the CCW’s Fifth Review Conference on 12-16 December 2016, where states are expected to decide whether to continue the deliberations on lethal autonomous weapons systems and, if so, whether to formalize the mandate to a Group of Governmental Experts and increase the time dedicated to substantive deliberations in 2017. A preparatory meeting for the Review Conference will be held at the UN in Geneva on 31 August–2 September 2016. The Campaign to Stop Killer Robots is calling on states to establish a Group of Governmental Experts or “GGE” that can begin formal negotiations in 2017 on a new CCW protocol on lethal autonomous weapons systems. A more substantive and outcome-oriented mandate would demonstrate progress and the relevance of the CCW in responding to increasing concerns. The CCW’s response to pressing issues of civilian harm has been criticized as inadequate ever since the failure of the First Review Conference in 1996 to effectively address the humanitarian impact of antipersonnel landmines. The CCW however provided a useful incubator for efforts to address the humanitarian consequences of antipersonnel landmines in the 1990s and cluster munitions in the 2000s. If the Fifth Review Conference fails to continue the CCW deliberations on killer robots, one obvious route to conclude a ban would be to start deliberations outside the CCW in another forum. The formal title is the Convention on Prohibitions or Restrictions on the Use of Certain Conventional Weapons Which May Be Deemed to Be Excessively Injurious or to Have Indiscriminate Effects. The CCW entered into force on 2 December 1983 and contains five protocols: Protocol I prohibits non-detectable fragments; Protocol II and Amended Protocol II regulate antipersonnel landmines, booby traps and other devices; Protocol III prohibits certain uses of incendiary weapons; Protocol IV bans blinding lasers; and Protocol V addresses explosive remnants of war. Statement of US, Convention on Conventional Weapons annual meeting, Geneva, November 13, 2015. Notes by HRW. Pekka Appelqvist, Maya Brehm, Monika Chansoria, Bonnie Docherty, Sarah Knuckey, Kathleen Lawand, Catriona McLeish, Elizabeth Quintana, Heather Roff, and Karolina Zawieska. After the CCW adopted a weak amended protocol on landmines at the First Review Conference, Canada launched the Ottawa Process that created the 1997 Mine Ban Treaty. Again, it was the failure of the CCW’s Third Review Conference to effectively tackle the humanitarian concerns over unacceptable harm caused by cluster munitions in 2006 that led Norway to embark on the Oslo Process to establish the 2008 Convention on Cluster Munitions.